Time for episode 45, the second part of our Dune coverage! A runthrough of the Steam game streaming beta. The new mobile version of Dungeon Keeper is somewhat disappointing. Then we get to the second half of our Dune coverage, covering the Westwood group of Dune games, starting with Dune 2. Wow cool, The development story kept pushing my memory buttons. First was the mention of Mars Saga, which I played on the Commodore 64 to extreme distraction. 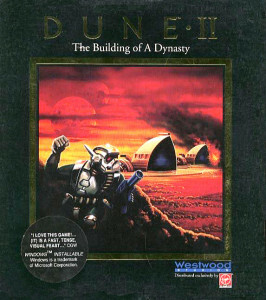 That was one of the first games my wife and I fought over the computer to play. A neighbor also played and got sucked in just as bad as we did. One time his wife left for the day and took the game disk so our neighbor would clean house and change diapers while she was gone. I played it all the way through on the Commodore, and looked for it when we eventually got a PC, and found Mines of Titan. I thought it was strange that they changed the name for the PC release (I didn’t know the details), and thought that it made a whole lot more sense set on Mars rather than Titan. I never did play through on the PC, so I never noticed any major improvements. The second game you mentioned that poked my memory was Battletech: The Crescent Hawk’s Revenge. I never actually played that one, but I played obsessively the previous game: Battletech: The Crescent Hawk’s Inception, also obsessively, also on the Commodore 64. I always wanted to play the sequel, but somehow never did. Anyway, love the show, looking forward to the replay of the TISF episode next time.